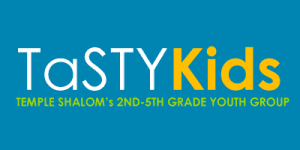 TaSTYKids is a youth group for Temple Shalom that aims to give some of the younger community members an opportunity to get to know each other on a more social level. Open to all TS kids regardless of if they are enrolled in the religious school, so long as they are members of TS and are in grades 2nd-5th. Parental involvement is welcome but not necessary. These events are geared to help build community with the TS 2nd-5th graders. For all activities that take place after Sunday school, we will plan to have your children meet us at a predetermined location, so you will not need to pick your child up until the end of the event. Is your child involved in the Youth Choir or Beit Din? No problem! We will plan to have icebreaker games for the first half hour and then lunch following to accommodate these two programs. Please contact Jessy Smith for more information. Click here to join our TaSTYKids Facebook Page! *Please note that we want all 2nd – 5th graders to be able to attend TaSTYKids events and we do have the ability to provide financial assistance to those who would like to participate who may need it. Please confidentially contact Jessy Smith.